I gave it up about 18 months ago. If you haven’t already done this, give it a try it is liberating. I was a 3 pack a day guilter so it wasn’t easy. I always had that feeling that whatever was wrong was my fault somehow. It comes high school where I was bullied everyday then moving straight into a job where the company culture was to sit the staff down and tell us that we should do anything they told us to because no one else would hire us. I already knew from school; comply and conform is the only option for acceptance. Doh, talk about negative reinforcement! Closed doors, must be talking about me. Something goes wrong on a project that I’m only slightly connected with, must have been something I’ve done. CCB in bad mood, yup, must have been something I said or did. It got to the point where guilt was starting to control my life. So I went for my walk feeling guilty and then it hit me… why am I feeling this way? I deserve to get fit; I have the right to want what I want. Then I thought about the work situation. I didn’t notice any of the boys volunteering to step back, so why should I? I’m a key part of this team and I should be at this event. I’m proud of the work I’ve done to get this up and running. Bugger it, I’m not having that chat with the boss tomorrow and I refuse to feel guilty about it. So that is the day I gave up guilt. I feel lighter and strangely more confident when I reply “That’s a shame, what is being done to resolve the issue?” instead of immediately trying to find a way that I messed up and jumping in to help “fix” it. 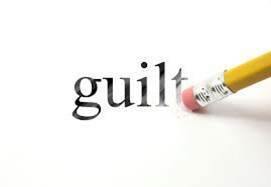 Guilt is a highly addictive, nasty, destructive habit that is bad for your mental health. Giving up is hard, but not giving up is worse. Take a hint from Tay Tay** and Shake It Off, Shake It Off. ** I wonder how different my high school years might have been if Ms Swift rather than Mr Farnham was the soundtrack! Sure did, it was a great event, our customers had a ball and went away with a stack of learnings.